I have always loved glass. The cold, smooth surface, the vibrant colours and the way it looks when illumined by light.. As a was a teenager I collected so much retro glass that I had no where left to put it! 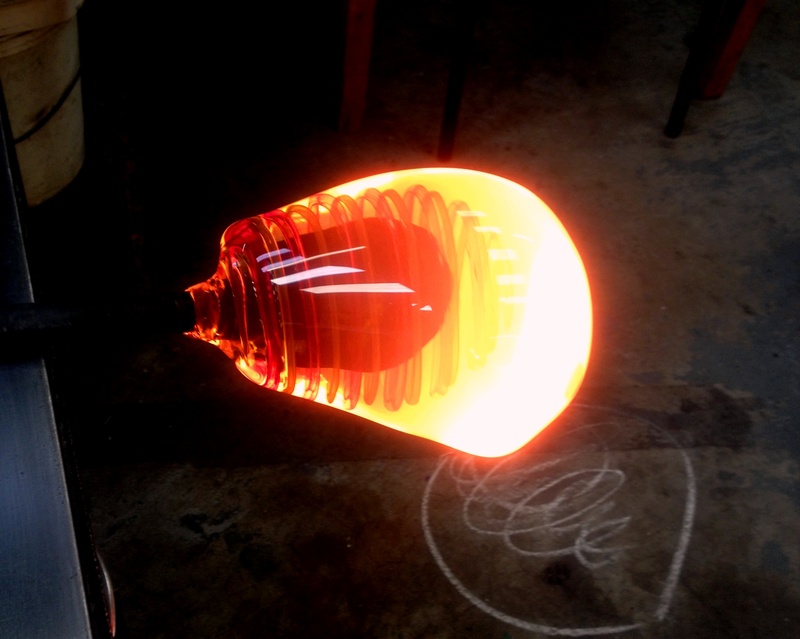 Ever since then I’ve fancied having a go at glass blowing. I thought it was something that I would do some day. The trouble is that some day never really happens. Having a List for Living means that the some day has come. My friend Chantal, the flower girl, organised the day. As a creative person this is something that she has always wanted to do too. When I was writing my list Chantal told me she knew the perfect place. 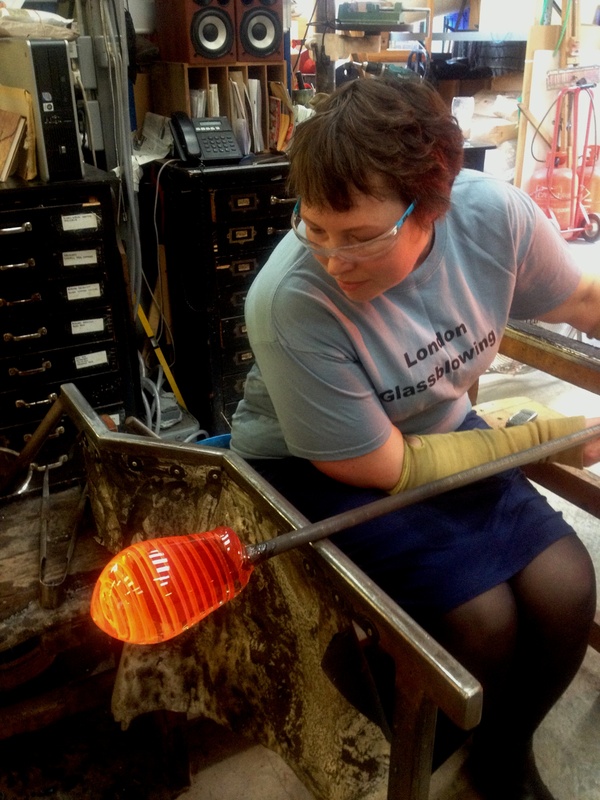 We went to the London Glassblowing Studio. 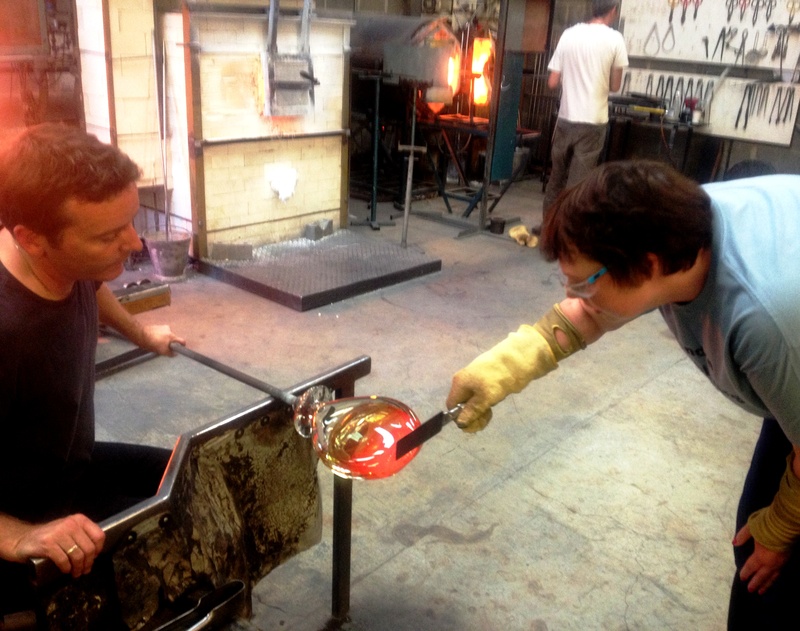 It’s considered to be one of Europe’s leading glassmaking workshops and it shows. The art that’s displayed in the gallery is incredible. As our lesson started I felt very inspired. My teacher was the talented glass artist Louis Thompson. He helped me to create a snowman. Yes, the first thing I made was a clear glass snowman! But we managed to progress onto more complicated pieces. Chantal and I had one to one tuition and we managed to make several items. Her work was delicate whereas I like my glass to be chunky. It may not look too complicated but this is hot and heavy work. I had to borrow a t-shirt so I could cover up. The furnaces are heated to hundreds of degrees centigrade. As soon as I got close it felt that my skin was screaming. To start with you get a lump of almost liquid glass. You manipulate it. Twirling, moulding and squashing. Keeping it hot by putting it in the glory hole (yes it really is called that) every so often. Advancing onto adding colour and bubbles. 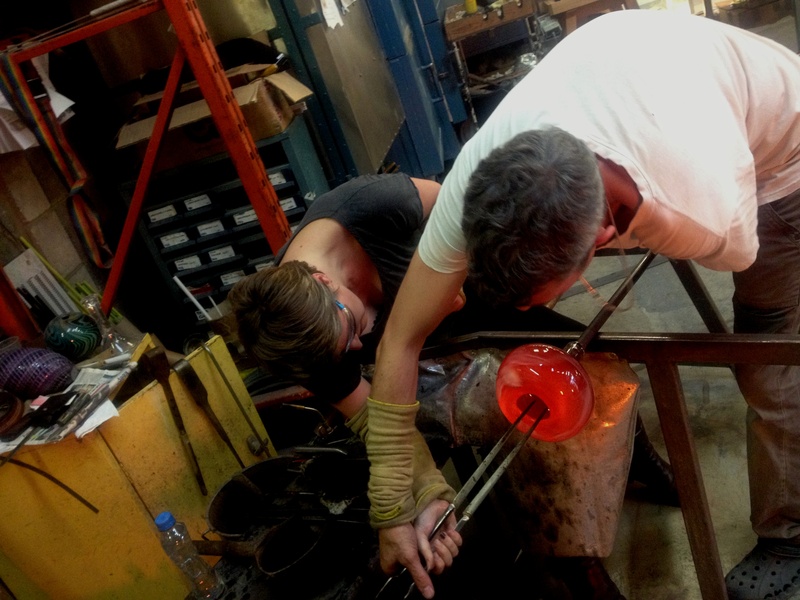 And then you come onto the actual glass blowing. It was so hard that it made me dizzy. 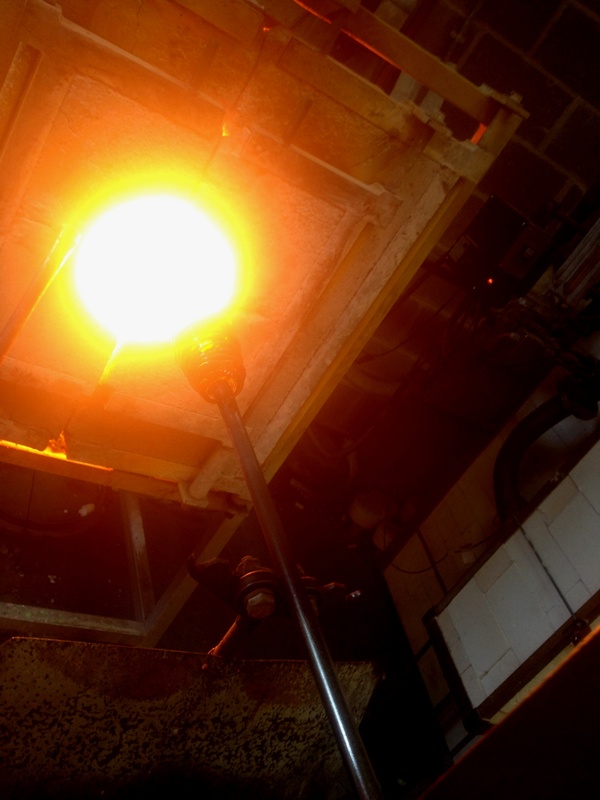 It was amazing to watch a lump of molten glass on the end of a metal pole transform into something stunning. It’s hard to believe what we were able to make. It all had to go into a special kiln for a day or so to cool down very slowly. It meant we had to leave our work there so I’m yet to see the finished glass! Over the last year and a half Chantal has spend lots of time helping me with hospital stuff. She’s given me countless lifts in her massive flower van. This was a lovely opportunity to do something together which didn’t involve anything medical and to create something so very beautiful. Twenty years after graduating I was back at my old university. Once again I was wearing a long black robe. But this graduation ceremony at Goldsmiths College was very different to last time. I was there to receive an honorary fellowship. It was such a wonderful surprise when I found out that I’d been nominated. I was put foward by my lovely radio lecturer Tim Crook for services to journalism – my work as a BBC correspondent and this blog! The ceremony was held in Goldsmith’s grand hall. One by one the students from my old course came onto the stage to receive their degrees. I may be a little bit older than most of them but I felt like I should be sat where they were, rather than on the stage next to Warden and the Chair of the college. I felt more nervous that I did two decades ago. Right at the end of the ceremony I had to give a speech. Hundreds of people were watching; this was much more scary than any live broadcast. 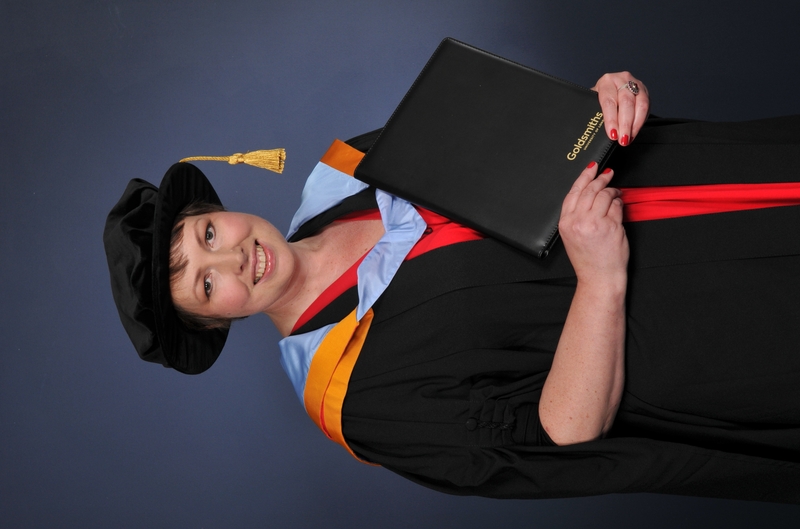 Then I was made an honorary fellow. With my mum and dad sat in the front row, it was one of the proudest moments of my life. Being back at uni made me think about my career and my big foreign adventure. I realised that it if wasn’t for the cancer when I was 30, I probably wouldn’t have achieved half of the things I have. I also doubt that I would have got this honorary fellowship. It’s a strange feeling having brilliant things happen while at the same time as I have a killer disease. It made me think about an incredible woman I recently interviewed. It was for a documentary I’m making for the BBC World Service about bucket lists. Susan Spencer-Wendel is terminally ill with ALS, a condition which destroys the nerves that powers her muscles. She wrote the bestseller, Until I Say Good-Bye: My Year of Living with Joy. Reading the book has helped me to understand these kind of experiences. Susan talks about making the best possible outcome from the worst possible circumstances. That’s exactly how I feel. Almost 1,2,3 on the List for Living! Hooray I’ve found a place in the countryside! It’s a fantastic feeling to be well on my way to doing the top three things on my List for Living. I’ve wanted to move to the countryside for a long time. It’s so easy to say that you’ll do it one day but just not yet. It was only after I’d been diagnosed with cancer for the third time that I knew I had to stop dreaming and get on with it. After I’d come up with my list and I was going through chemo once again I would think about all the lovely things I was going to do. I imagined that I’d move in a honey-coloured cottage somewhere in a picture postcard village. Complete with wooden floors, timber beams and an open fire. Ha, the reality is very different. 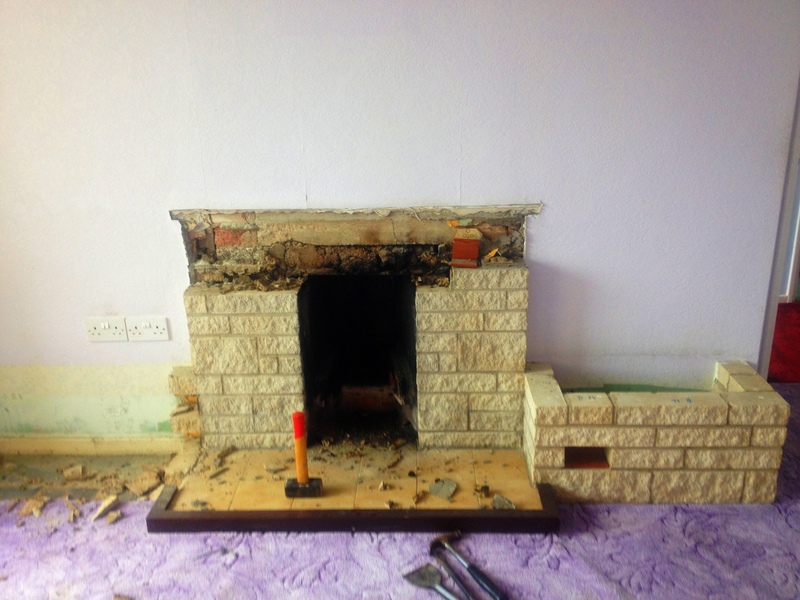 My new place has every kind of coloured carpet, polystyrene tiles on the ceiling and this ugly fireplace made of bricks. But that doesn’t matter. Soon it will all be gone and this will be my home. That is, after a whole load of work. It’s good to be able to focus on something that’s not cancer related. We need to replace decades of decorating. Just for starters, all the wallpaper has to be striped off the walls. 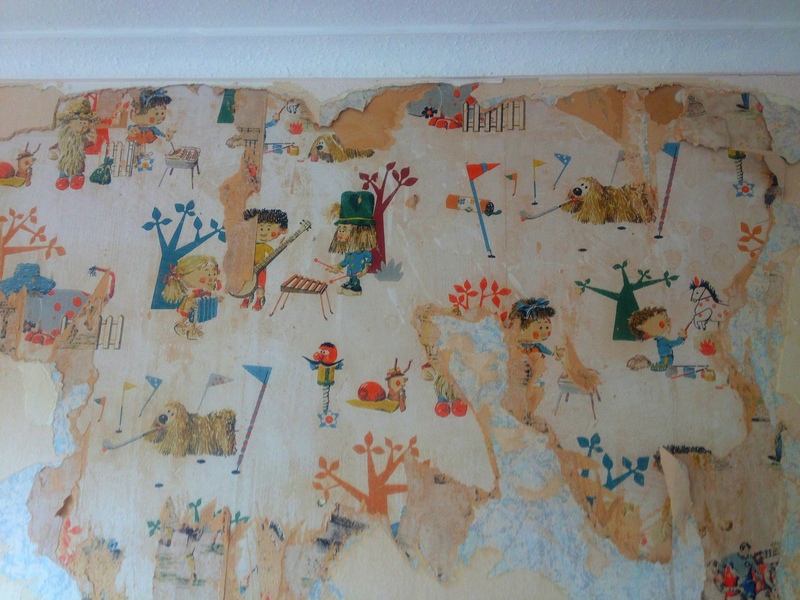 In what must have once been a children’s bedroom, sometime in the 1960’s, we have just got back to the Magic Roundabout. Once Zebedee and his friends are out and the place is a bit more modern I’ll be able to move in. Then I can start looking for a dog. Something else I’m really looking forward to. It will be a while though. I’m already finding the waiting quite hard. When you’re told you might not have long to live, it’s difficult to make plans. You want it all to happen NOW! Anything more than a few weeks away and I wonder if I’m still going to be around. But here I am. And I’m confident that I will be able to tick off number 1,2 and 3 from my List for Living. After all these are some of the things that mean the most to me.